Human parainfluenza viruses (HPIV) cause respiratory illnesses commonly in infants and young children, but anyone can become ill once infected. There are four types of HPIVs (HPIV-1, HPIV-2, HPIV-3, and HPIV-4). HPIV-1 and -2 are most commonly associated with cold-like symptoms. 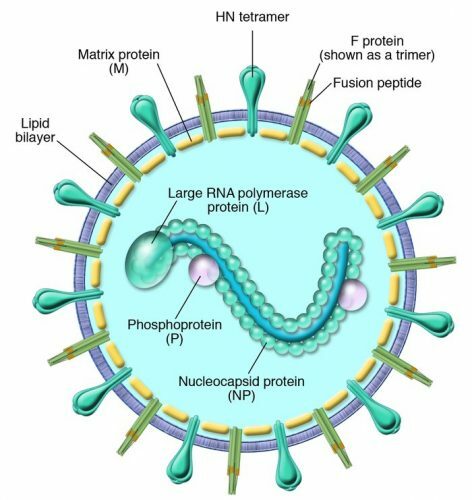 HPIV-3 is often associated with pneumonia. HPIV-4 usually causes mild to severe illness. Learn more about non-influenza respiratory viruses. Symptoms develop 2-7 days after you are infected. Symptoms of upper respiratory illness due to HPIV infection include fever, runny nose, sore throat, sneezing, wheezing, and cough. Severe symptoms due to lower respiratory illness may include croup, bronchitis, and pneumonia. Young children and older adults with weakened immune systems are at risk for severe illness. HPIVs are spread through the air by coughing and sneezing, close personal contact, and by touching surfaces contaminated with HPIV. The virus can stay in the air for over an hour and can survive on surfaces for a few hours. HPIV infections can be diagnosed with confirmatory tests by polymerase chain reaction (PCR), detection of viral antigens in respiratory secretions, viral culture, and HPIV-specific antibody detection. There is no specific treatment for HPIV illness. Treatments for symptom relief include taking over-the-counter medication for fever, cough and sore throat, drinking plenty of fluids, and resting. Most people with HPIV will recover on their own. Infection with HPIV does not mean you are protected from future HPIV infections. You can have multiple HPIV infections in your lifetime. Anyone can get infected from parainfluenza viruses. People usually get sick with HPIV infections during the spring, summer, and fall seasons. There is currently no vaccine available to protect against HPIV infection. Reduce your risk of HPIV infection by washing your hands frequently with soap and water, avoiding touching your eyes, nose, and mouth, and avoiding close contact with sick people. If you are sick, protect others by staying home, covering your mouth and nose when you cough or sneeze, and disinfecting objects and surfaces. HPIVs commonly infect infants and young children. People can get multiple HPIV infections in their lifetime, and reinfections can cause serious lower respiratory tract illness such as pneumonia, especially in older adults and immunocompromised patients. By the age of 5, most children will have antibodies against HPIV types 1, 2 and 3.